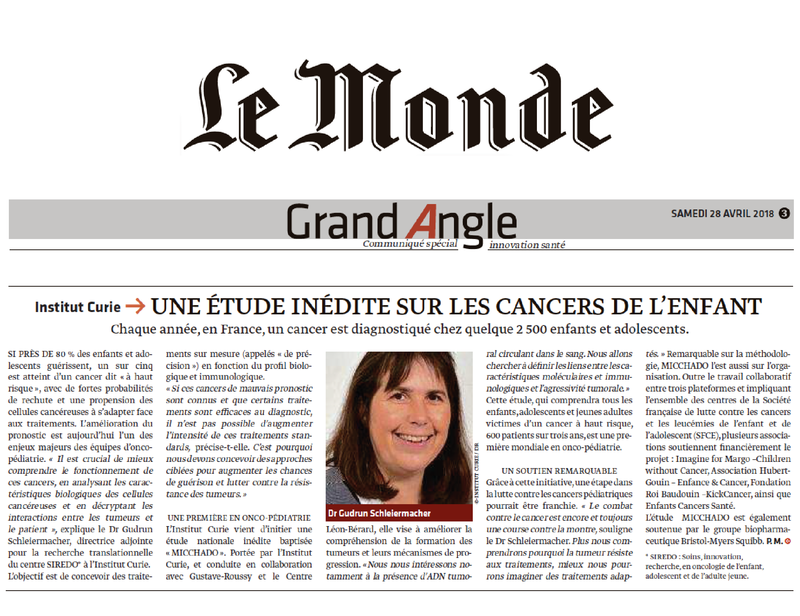 Discover how your donations are a real contribution to make research progress in this newspaper article of Le Monde published on Saturday, April 28th. In 2016, we gave a €1.2 million check to the Curie Institute to co-finance MICCHADO research program: “UNPRECEDENTED in oncopediatrics”, thanks to the amazing commitment and generosity of our runners, volunteers and partners of the Children without Cancer race. Each year, in France approximately 2,500 children and teenagers are diagnosed with cancer. The Curie Institute has just started an unprecedented national study called MICCHADO. Supported by the Curie Institute and led in cooperation with Gustave-Roussy and the Center Léon-Bérard, it aims at improving understand how tumors develop and progress. “We are especially focused on the presence of tumoral DNA in the blood. We will try to define links between molecular and immunological characteristics and tumoral aggressiveness.” This study, which will include all children, teenagers and young adults suffering from a high-risk cancer, 600 patients over 3 years, is a world premiere in oncopediatrics. Thanks to this initiative, a step in the fight against pediatric cancers might be reached. “The fight against cancer is still a race against time, highlights Dr Schleiermacher. The more we will understand why the tumor resists treatments, the better we will imagine adapted treatments.” MICCHADO is noteworthy regarding both the methodology and the organization. In addition to the cooperation between three platforms and concerning all centers of the SFCE (French Society to fight against children and teenagers’ cancers and leukemia), many associations give a financial support to the project: Imagine for Margo-Children without cancer, Hubert-Gouin – Childhood & Cancer, the KiCa Fund hosted by the Roi Baudouin Foundation, and Children, Cancers, Health. MICCHADO is also supported by the pharmaceutical group Bristol Myers Squibb. *SIREDO: Care, Innovation, Research in children, teenager and young adult oncology.